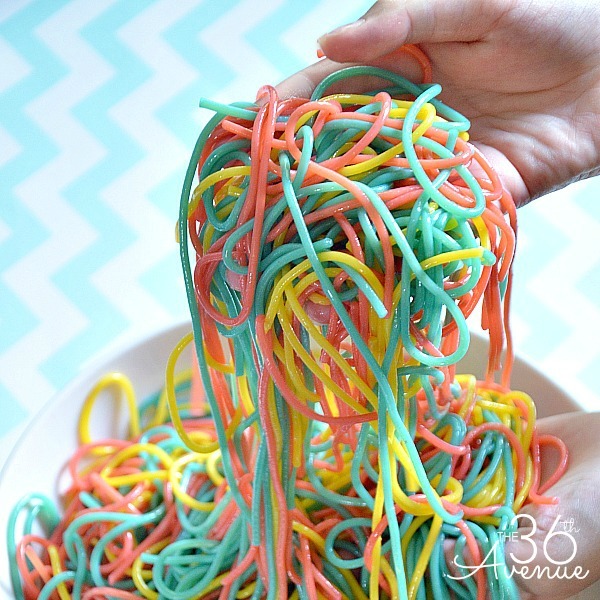 Today I am going to share with you a quick and super fun Kid’s Activity that I guarantee kiddos of all ages are going to love. I came up with the crazy idea to make Spaghetti Slime and our kids had a blast playing with it. These are the best couple of dollars I have ever spent! Look at how fun this looks! Divide 1 box of spaghetti in three parts. Put 4 to 5 Cups of Water in a pot and add one packet of Kool-Aid of your choice and bring it to boil. 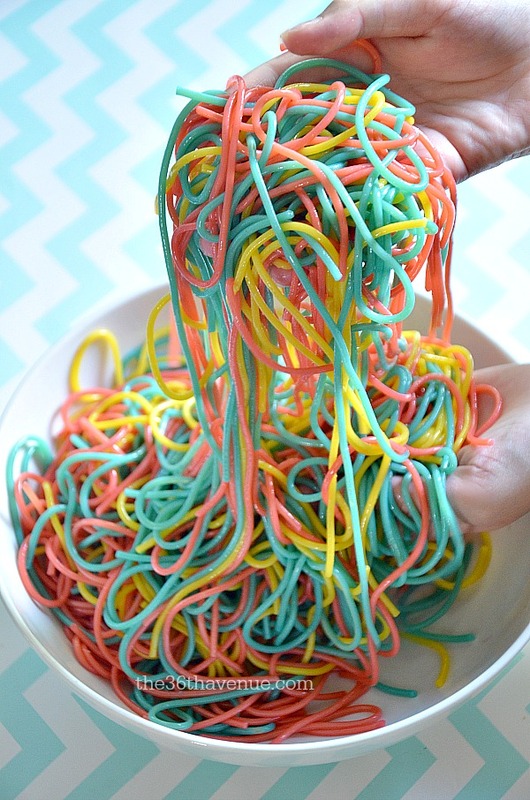 The spaghetti will turn the color of the Kool Aid… Have fun choosing! When the water is boiling cook one portion of the spaghetti in it. 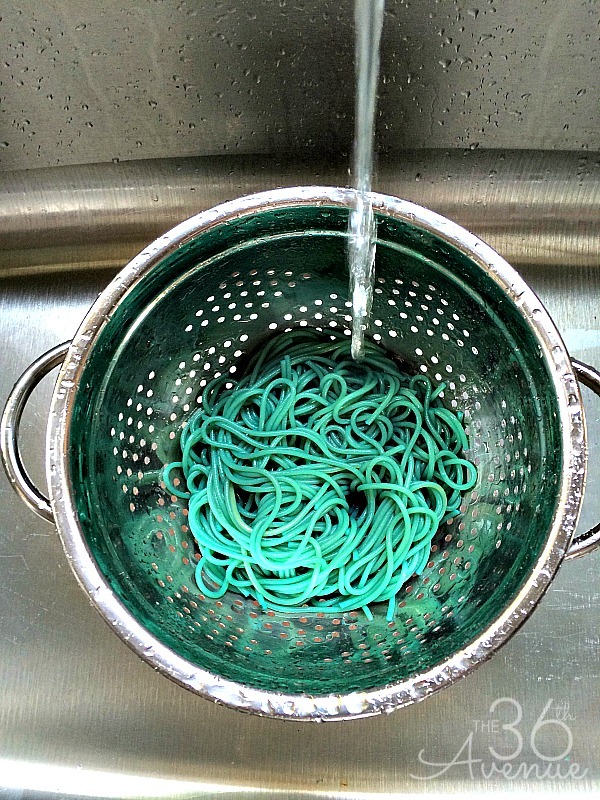 When the spaghetti is cooked it will turn the color of the water. … and wash it with cold water. 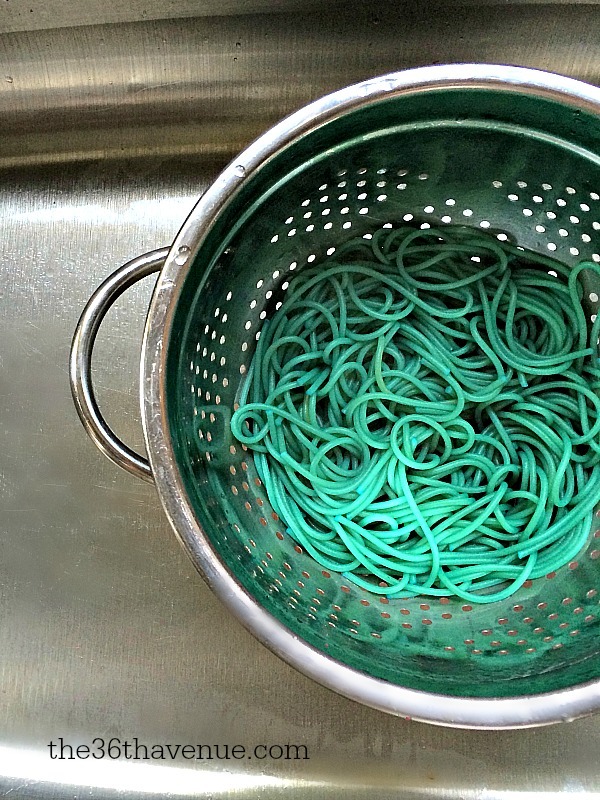 Drain the spaghetti once again and add about one tablespoon of oil. You are done and it’s time to play! 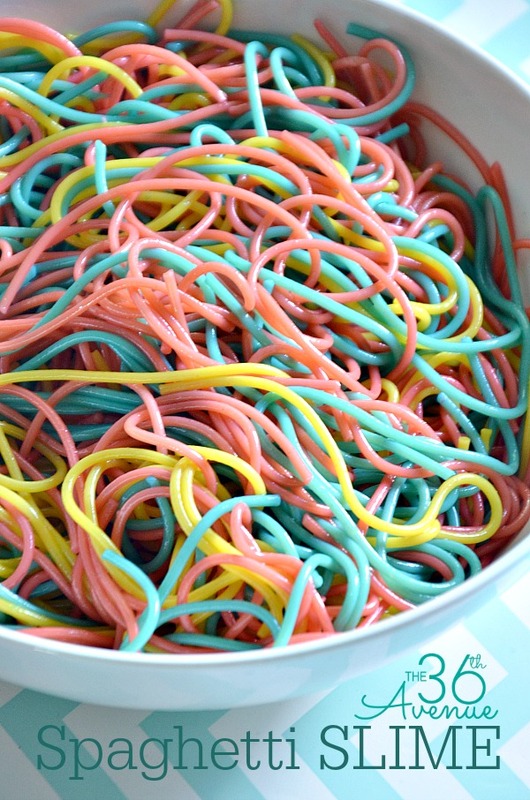 It is slimy, colorful, smells delicious and it doesn’t stain! My kids were playing with it for hours… So fun! Give it a try… It is so much fun! 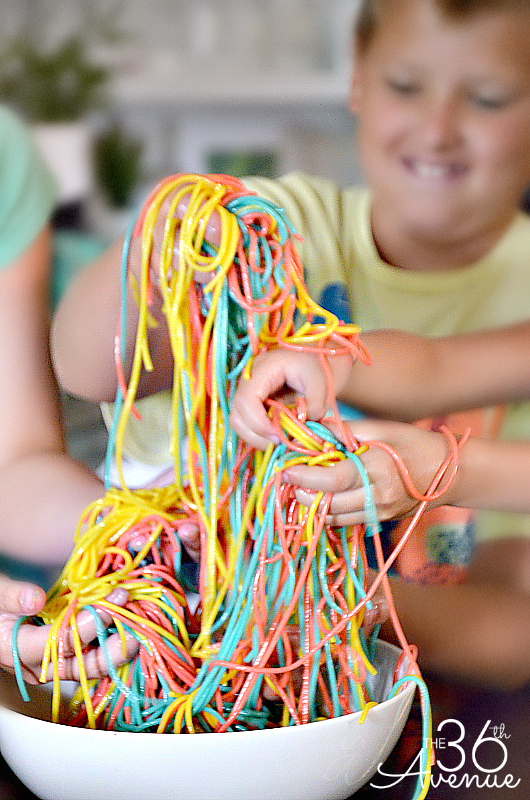 Before you go make sure to check out these other Kid’s Activities. 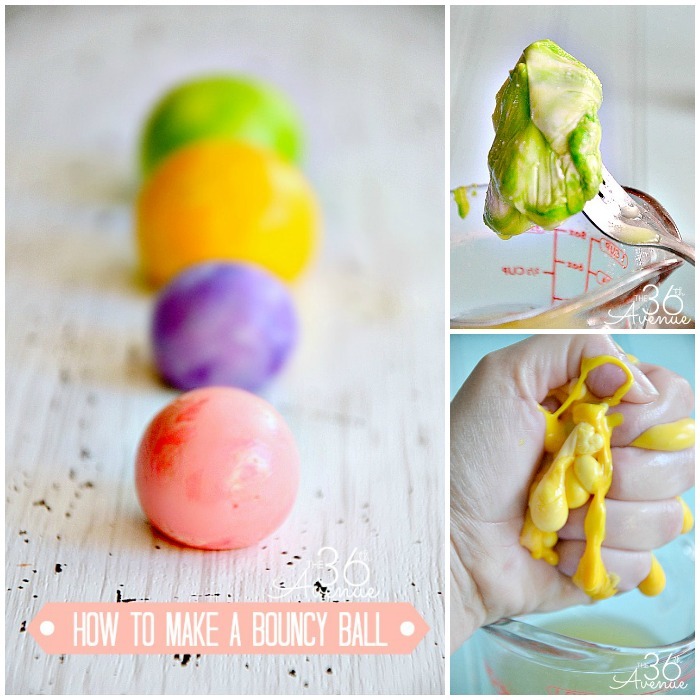 Click HERE to see How to make a bouncy ball! How to make Glittered Slime HERE. 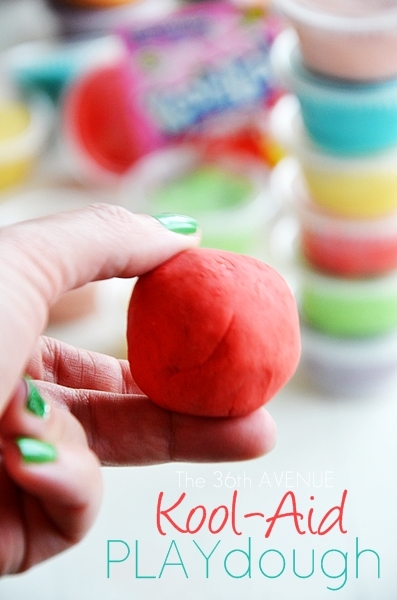 Click HERE to see How to make Kool Aid Play Dough. We know how to have fun around here! I can’t wait to try this with my kids! I work with small children in the autism spectrum and with other special needs. I made this for each of them in red and green colors for Christmas. About half of them did not like it and the other half loved it. I had lots of fun playing with it with the students who did enjoy the slime. Thank you! This looks like a lot of fun. Thanks for sharing. Hello from The Party Bunch! My kids love it… Have fun!!! Can’t wait to try this, looks like so much fun! 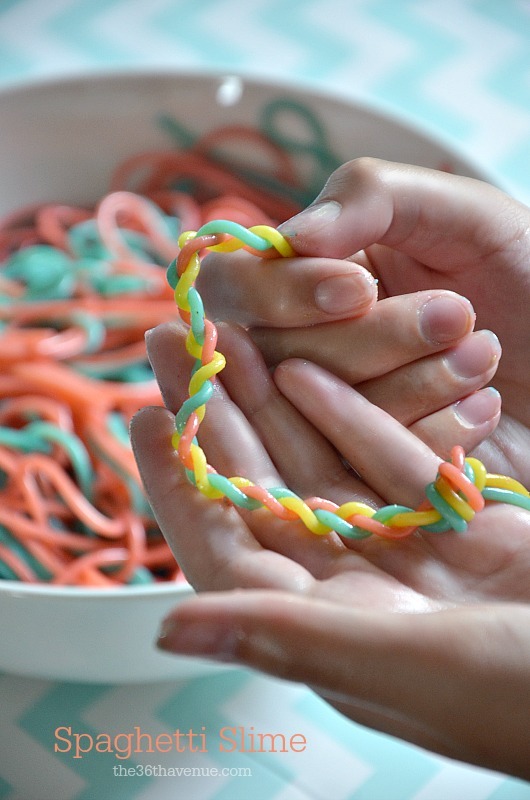 What a fun activity, can’t wait to try it! What a fantastic idea … so simple but looks fabulous! That looks like so much fun! Thanks for sharing!!! !